Click here for a map of interesting places to see in Tuscany and Umbria. More places of interest and sights of Umbria, Italy. 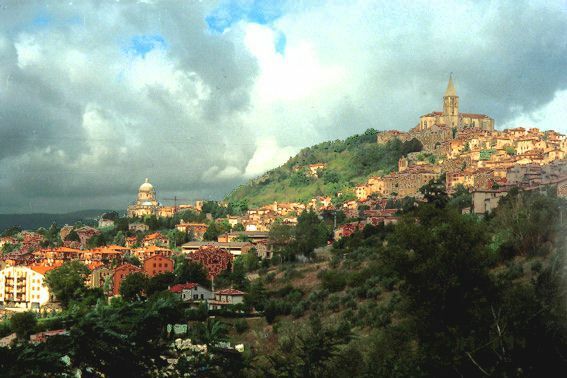 Deruta is a major centre for the production of painted ceramics in Italy and this is the main reason to visit this attractive town in the Province of Perugia. Nevertheless, there are a fine gothic church and an art museum housing a fresco by Perugino. The majolica museum is excellent and there are of course a considerable number of ceramics shops. Note that some of the larger outlets are outside and below the town. Don't come here expecting bargains: deruta-ware is hand-painted, high quality and produced in many small factories and homes. Deruta majolica is not a mass-produced product. Worth a visit. More about Deruta ceramics. 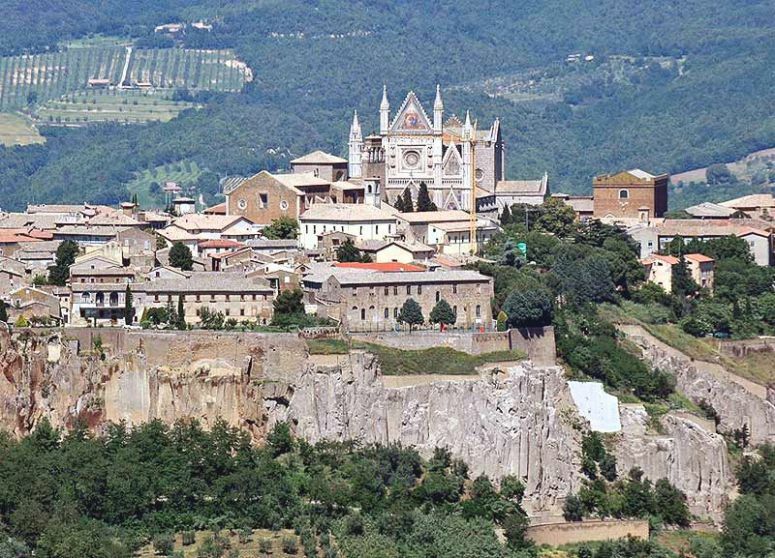 Orvieto is situated on the flat summit of a large butte of volcanic tuff, one of the most dramatic townscapes in Europe, rising above the vertical cliffs that are extended by defensive walls of the same stone. The facade of the Duomo of Orvieto, a masterpiece of Italian gothic art, is equally spectacular, consisting of bands of black and white stone decorated with bronze dragons, gold mosaics and marble bas-reliefs by Lorenzo Maitani. Other sights are the deep spiral Well of St. Patrick (Pozzo di San Patrizio) and other caves and tunnels, some dating from Etruscan times. Worth an extended visit. More Orvieto tourist information. 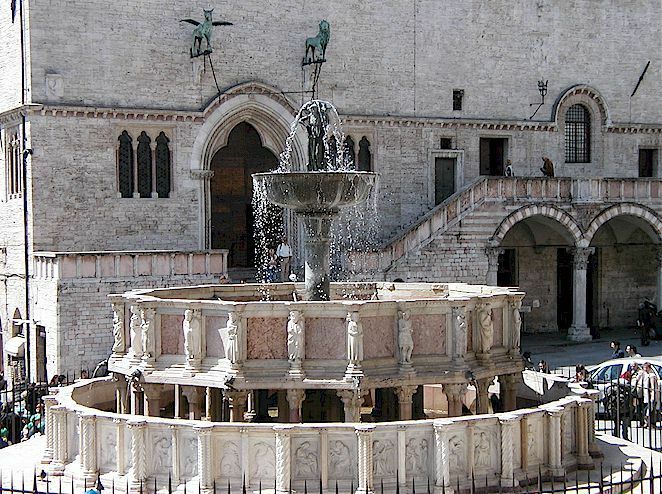 Perugia is the capital of Umbria and a major centre of Italian art and architecture. The Cathedral of S. Lorenzo stands on the Piazza IV Novembre which is also the location of the splendid Fontana Maggiore. Another side of the piazza is formed by Palazzo dei Priori (the Town Hall, encompassing the Collegio del Cambio, Collegio della Mercanzia, and Galleria Nazionale). The Collegio del Cambio has frescoes by Pietro Perugino, while the Collegio della Mercanzia has a fine later 14 C wooden interior. Other major sights are the Church of San Pietro and the Tempio di San Michele Arcangelo, a round church built on the foundations of a Roman temple. Worth an extended visit. More about the art city of Perugia, Italy. Lake Trasimeno, known historically as "the lake of Perugia", is the largest lake in peninsular Italy, being slightly smaller than Lake Como. The lake has three islands, one inhabited, and several attractive villages on its circumference. 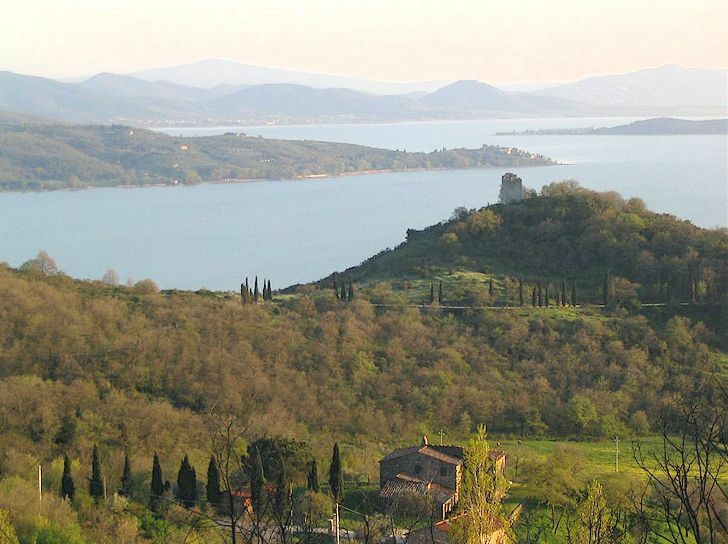 Passignano, Monte del Lago and Castiglione del Lago have all remained virtually intact through the centuries. The shores of Lake Trasimeno are for the most part dense with reeds that are the home to a wide range of bird-life. A drive around the lake makes an excellent one day excursion. Worth a visit. More about Lake Trasimeno, Umbria, Italy. Todi was important to both Etruscans and Romans and is the location of several interesting Gothic and renaissance buildings, including the 11 C cathedral and 13 C palazzi. Its triple walls are still easily discerned. The innermost is Etruscan, the middle wall is Roman, and the outside wall dates from the 6 C or 7 C. Todi's most striking church is the domed Renaissance Church of Santa Maria della Consolazione beautifully located just outside the city walls. Worth a visit. More about Todi, Italy. 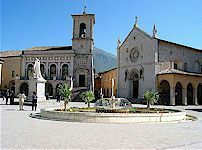 Norcia is a charming small town located in the highlands of Umbria, surrounded by the rounded Sybelline Mountains. Norcia is famous both as the birthplace of Saint Benedict and for its pork products, and it is a centre for buying black truffles and sampling dishes prepared with truffles. In addition, the lentils grown in the surrounding countryside are reputed to be the best in Italy. Unusually among the towns of Umbria, Norcia is flat with wide streets, making it a pleasure to visit its main sights. The main piazza is the location of the Palazzo Comunale, the Basilica of San Benedetto and the Castellina, as well as a statue of San Benedetto. Other architectural gems are scattered about the town. More about Norcia, Italy. Gardens of some of the famous villas located in the Chianti and Tuscany countryside. 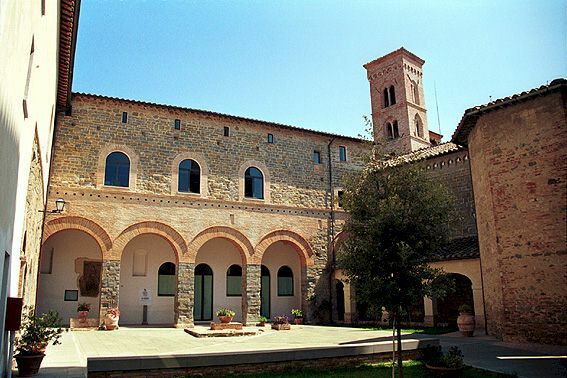 Pictures and descriptions of historical villas located in the Chianti and Tuscany countryside.